Mumbai: Engineering and construction company Larsen & Toubro Ltd (L&T) is exploring the possibilities of making components of passenger aircraft at its factory at Coimbatore in Tamil Nadu. This will mark the entry of private players in aircraft component manufacturing for bigger jets at a time when India alone is going to buy 500 civilian planes in the next five years for scheduled operations. Until now, state-run Hindustan Aeronautics Ltd, or HAL, was the only company undertaking the manufacturing of components such as doors for bigger passenger planes made by Airbus SAS of Toulouse, in France and Boeing Co. of Seattle, US. Planning stage: A 787 Dreamliner under construction at the Boeing Co. plant in Everett, Washington. L&T is in talks with Boeing and European Aeronautic Defence and Space Co., the parent company of Airbus. Bangalore-based Taneja Aerospace and Aviation Ltd is currently making components and two- and six-seater aircraft that are used for private and business purposes. Besides high precision components, L&T is also looking at parts such as doors, and the company is in talks with Boeing and European Aeronautic Defence and Space Co., the parent company of Airbus. India accounts for about 10-12% of the combined order backlogs of Airbus and Boeing. Airbus pegs India’s demand for airlines at 1,100 aircraft worth $105 billion (Rs4.15 trillion), over the next 20 years, according to the Associated Chambers of Commerce and Industry of India. “Certainly, we are looking at making components for passenger planes. But plans are not concrete as of now," said M.V. Kotwal, senior executive vice-president of L&T. “We do not need any special permisions for making components of passenger airplane. Our precision manufacturing facility at Coimbatore can meet the requirements of civilian planes," Kotwal said. L&T now has the capability of designing and manufacturing components, subsystems and systems for aerospace applications. The company can make rocket motor casings, convergent and divergent nozzles, titanium gas bottles for liquid stages and titanium tanks for liquid upper stages for launch vehicles. Kotwal added the company is looking at business arising out of offset obligations of the aircraft manufacturers who are selling planes to India. According to India’s new defence policy, foreign vendors securing domestic contracts must source at least 30% of the value of any deal within India. “L&T is in the process of taking licence from government to make parts for space aircraft. It will participate in space programmes as well as manufacture of sub-assemblies, systems and subsystems for airplanes," said a senior L&T executive, who does not wish to be named. “HAL is currently making right and left hand doors for A320 and A319 airplanes made by Airbus SAS. 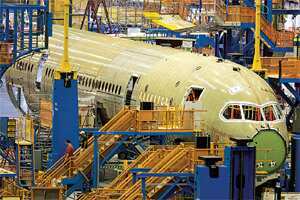 In association with Israeli Aerospace Industries Ltd, HAL is also manufacturing door kits for the programme of Boeing Company in converting B737 passenger airplanes to cargo planes," said A.K. Saxena, who recently retired as managing director of HAL. An executive of Taneja Aerospace, on the condition of anonymity, has said his company is also looking at component manufacturing for bigger passenger planes. “There are small companies in Bangalore (that) are providing very small subsystems and minor parts of engines for these big plane makers. With L&T’s entry, more corporate houses will take plunge into this scene," said one industry expert.